When winter has covered the world in a palette of glistening snow, the sight of a boldly colored cardinal becomes infinitely more beautiful. Like nature's own holiday ornaments, cardinals dazzle us with their full-bodied redness proudly on display. Now, you can enjoy the sight of cardinals adding their charm to a stunning holiday gathering of silver and golden tones with the Thomas Kinkade Treasures of the Season Table Centerpiece, available exclusively from The Bradford Exchange. Combining the artistry of Thomas Kinkade with a handcrafted Always in Bloom® floral arrangement, this centerpiece is sure to make the season sparkle.A dense layer of realistic evergreen provides the backdrop for the brilliance of crimson and the sparkle of antique silver provided by the sculpted cardinals, blooming roses and handmade poinsettia blossoms throughout the arrangement. 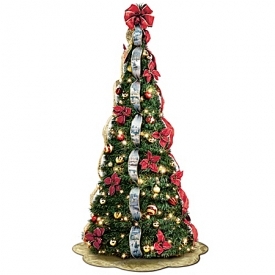 The poinsettias are finished in glittering silver and soft cream colors, and pine cones placed throughout the display are painted in golden tones. 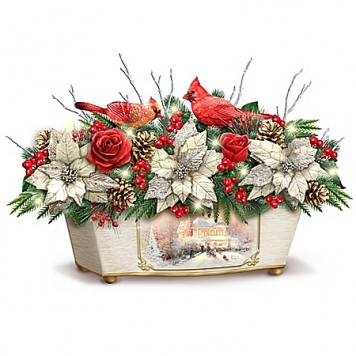 Accents of red berries and silver twigs complete the design, creating the perfect setting for the songbirds. 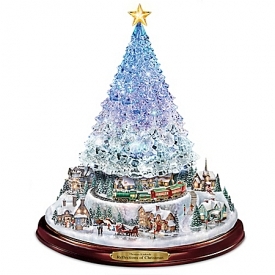 The golden planter is crafted of artist's resin and features a golden frame at the center with Thomas Kinkade's "Victorian Christmas II" artwork. Plus, at the touch of a switch, long-lasting LED lights interspersed among the poinsettias and greenery illuminate to cast sparkling reflections throughout the display. 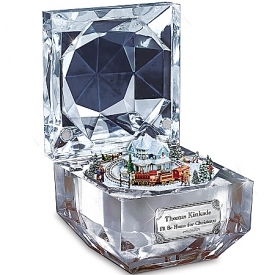 Strong demand is expected for this limited-edition Thomas Kinkade home decor treasure, so don't delay. Order now!